My dad has told me time and time again that I should cut coffee out of my life. But, it just isn't going to happen. Not anytime soon at least. Like the rest of this world, I adore (depend on) coffee. But I would be lying to you if I said I had an 'experienced palate'. Sure, I enjoy a few cups a day, but the extent to which I've experienced the world of coffee is limited. From Toronto's finest hipster joints to Yonge Street's filthiest McDonald's, I grab whatever is most convenient. My love for coffee began in high school. I followed in the footsteps of my father and then, my brother. At first, drinking coffee allowed me to be apart of an exclusive club that indulged in a hot beverage only allowed before 6pm. It was an excuse to wolf down a handful of my Mamma Mamma's home-made bread-sticks or a few cookies kept in abundant supply above my refrigerator. My father only gave me the equivalent of a few tablespoons as a kid, and a majority of it was sugar. But it was enough to have me hooked by the time I became a teenager. Since then, coffee has become an enjoyable part of my day. It has brought me into many coffee shops across the country and has kept me awake during university and work. The owner of Grassetto Coffee is a good friend of mine. We were co-workers together for a few years in my hometown of Sault Ste. Marie doing cinematography and editing work. It didn't take long before I realized there was three things the guy loved: technology, cars, and coffee. So naturally, when I found out he was starting up this coffee venture, I immediately signed on as a loyal supporter. Ordering the beans was insanely easy. I simply visited GrassettoCoffee.com and added the new 'Knockout' blend to my cart. Zack was even kind enough to knock 15% off for me. There is a shipping charge of course, so don't be alarmed, but in the end, it's definitely worth it. Within a few days I receieved the beans in the mail and it took all of my will-power not to stick my nose in the bag. I wanted to finish my miscellaneous Wal-Mart beans first. My Grassetto beans arrived in sleek paper, air-tight, re-sealable bag. I genuinely appreciate that the bag is re-sealable with a zip-lock style. My pet-peeve with the way many companies package their beans is when they glue on a metal twist tie and expect that to properly seal every time. I've had the coffee now for a couple weeks and every time the bag is opened, it smells just as amazing as the first day. The smell of Knockout is unbelievable. As any coffee lover would suggest, I recommend purchasing the whole-beans for the best experience - both taste and smell-wise. I drink my coffee black and I prefer it to be quite bold. I've been drinking Grassetto for about two weeks and it has really grown on me. The first thing I had initially noticed was that it isn't as bold as what I am use to drinking. That being said, it is labelled as a medium roast, so that is to be expected. The taste is delicious and shares many similarities with a dark roast blend from Starbucks or Second Cup. For me, my coffee is nearly always accompanied by breakfast and Knockout was a perfect match for this. However, whereas before I rarely drank coffee at home without a meal, I now find myself firing up the coffee maker to have some Grassetto throughout the day. In fact, right now I am drinking a solo mug of Grassetto not because I need the caffeine, but because I genuinely love the taste. As the days went on, I began to like it more and more. Overall, I highly reccomend purchasing some Knockout coffee from Grassetto. I am not a coffee expert and my review might not give you the best description of what it tastes like. I don't know about the acidity of coffee or even how to describe aromas. 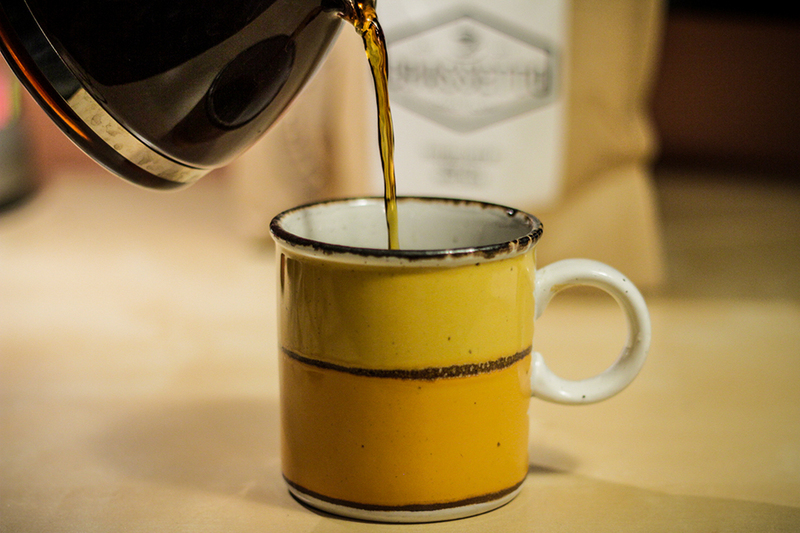 All I know, is that Grassetto's Knockout blend is a good cup of coffee. So go support a small-town business and a good friend of mine. Visit www.grassetto.ca. Right now they are offering free shipping on orders over $30.00.